A dynamic customer survey app for iPads built on our core survey engine to collect feedback from its patients. 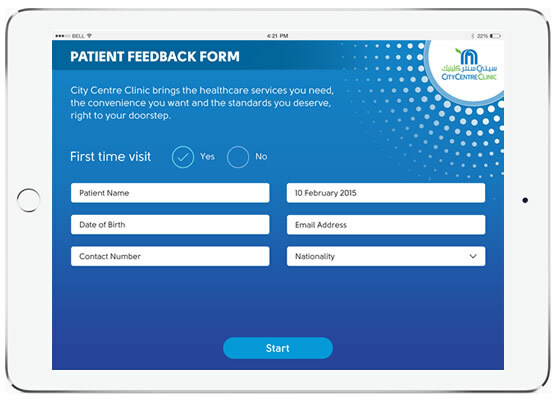 UCS developed a custom solution for patient feedback to allow City Centre Clinic to enhance its customer engagement and collect feedback from its patients. The app, using iPads present feedback forms and surveys that can be created and update as needed from a central survey management web application. The gather data can be analyzed instantaneously through data reporting and visualizations. Each survey can be customized with different question types and answer options.